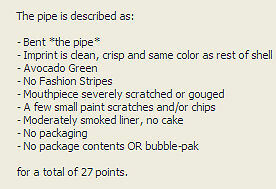 The value of pipe #350 is 27 points. D and B Enterprises ran an auction on eBay for more than 4 pipes, this one among them. It is less than perfect, but it is better than none. A much better example eventually came my way, so this one is now on the Pipes for Trade page. Bob Capello wrote and asked if I could find a green bent for him. Since I seldom smoke green pipes and this one has been for trade for a number of years with no takers, I sold it to him.